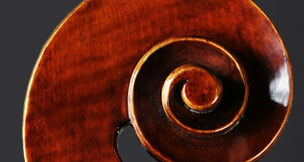 We're very proud to offer the finest, contemporary French and German upright bass bows available today. Below, we list the makers according to the model that we now have in stock. Click any one name for a separate page, with close up photos, approximate weights and measurements and more interesting information about their making backgrounds and experience of the maker. Most all of these bows, are pre-ordered to our exact specifications. We only select bows with the hardest, finest wood, and nothing too extreme in weight, or dimensions. We are extremely particular. All of our master bows at String Emporium, are special, one of a kind bows which are specially made and ordered to our own uniquel requirements: weight, lengths, balance, density of the wood is important and we even refuse bows that don't meet our high expectations. Our evaluations are pretty simple. We play every bow that comes in! For a 'master' bow, it has to be special. When you hold it up close, every detail has to be beautiful and beautifully made. It has to elevate your playing. Feel free to email us. In our French bow offerings, we want well balanced sticks that stay strong all the way to the tip of the bow! The French bows that we offer are modeled after the great French masters: Sartory, Vigernon, Fetique and Tourte. The German models, for the most part are all Pfretschner model bows. Our thinking on German bows is simple: Why fix something that isn't broken?? These models are chosen because they work! Also you will not see gaudy (over the top) engraving, ivory, or gold mounted bows here. We think these are a little over done and a waste of money. (Very few people in top professional orchestras bother or care about a gold bow!) Playability is everything. To see larger photos of these bows, simply click on the makers highlighted name to be taken to their respective page. There we'll show more bows, dimensions and prices. While we show one photo to represent the maker, we usually have more than one bow per model. This stock goes up and down with sales and re-stocking. For more detailed photos, weights and measurements, please click on the highlighted makers name for their own separate page. These represent some of the very best bows in the world and we encourage customers to try more than one bass bow at a time because you never know which one will be 'the one' that clicks with you (and your bass.) Here's more information about our bass bow trial service.